This is probably not a surprise if you know me in person. After all if you've seen me in the last month it's pretty obvious. Today marks 20 weeks into my biggest current project due to culminate on July 18. These were taken last Thursday. I hadn't been feeling much movement yet, but for at least the half hour we were watching this baby is on speed. Flips and kicks and yawns and waves. 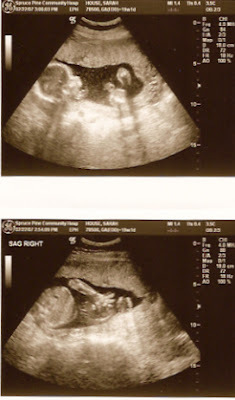 The first picture is profile and feet, the second is the top of the head and fingers. We counted all ten fingers and at least got to see feet, but not really toes. The face was mostly turned away, but we got a few quick glimpses. No idea on gender. Maybe we'll find out later, but for now it just didn't seem like we wanted to know. Everything is going well. I'm actually getting some studio work done, I'll never have all the pots ready that I need, but at least I won't be without any. 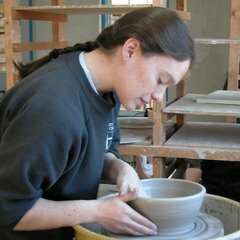 I'm hoping to be able to reach my wheel for another 8 weeks then start glazing and firing around the first of May. We'll see how that goes and if my body will stand for it. I'll take some belly pictures tonight when Kevin gets home and post them later. Horray for wiggle worms !! Congratulations! I hope you'll continue to do well. We found out with the first, but not the second. I'm pretty happy with both decisions. Good luck to you! We didn't find out with either of my daughters and I loved the surprise of it but there's something to be said for advance planning too.